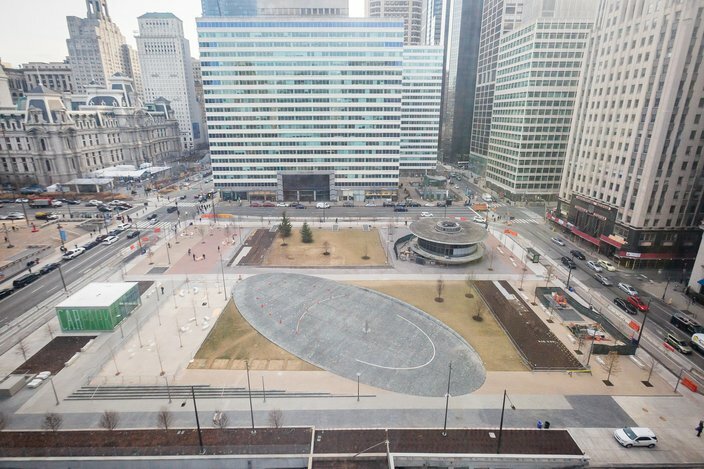 What's with the LOVE Park redesign? 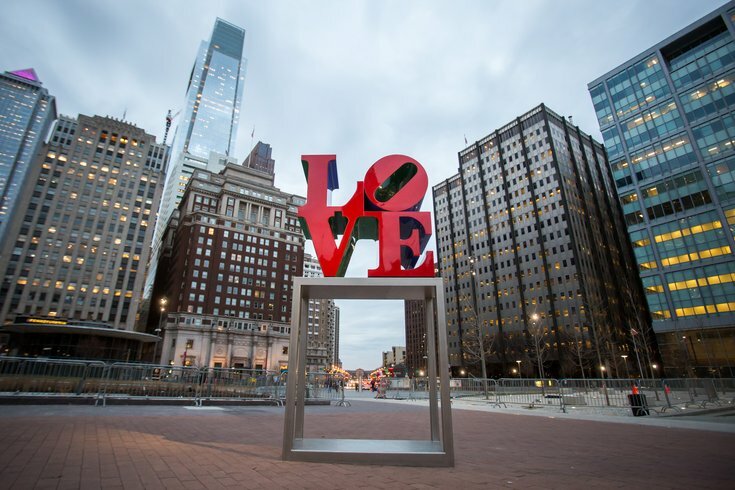 The refurbished LOVE sculpture at LOVE Park, Feb. 13, 2018. It’s a rainy, depressing Wednesday afternoon, so now feels like the perfect time to discuss what’s going on with the redesign of LOVE Park. The official ribbon cutting ceremony won’t be until May 30 but the LOVE sculpture returned to its perch in February, the basin-less fountain has been (unsuccessfully) tested and the gripes have already started rolling in. It all began back in 2014 with promises of a fountain and basin that would double as seating, diagonal pathways and the same ‘ole LOVE sculpture, but on an updated pedestal. The parking garage underneath the park would also be getting a facelift. Public meetings were held and it went through the Art Commission back in November. The Fairmount Park Conservancy announced a $250,000 gift from Bank of America to sponsor the plaza. And last Thursday officials held a small ceremony to dedicate a part of the park to the bank. But last week, it started to be apparent to Philadelphians that this is actually what the park is going to look like — flat, with no seating, indistinguishable from the sidewalk it sits next to. An aerial view of LOVE Park in Philadelphia following major renovations, Jan. 16, 2018. PlanPhilly talked to a park goer and transportation planner that called the new iteration a “hostile design.” And in response to that PlanPhilly piece Conrad Benner, the photographer and man behind the Streets Dept. art blog, called for anyone using Bank of America to close their accounts immediately. Perhaps part of the city’s collective “ugh” about LOVE Park is that the design has an impersonal, ephemeral way about it. It feels like it’s discouraging passersby from lingering in the space. The park was known for its activity; the inevitable whistleblower with a microphone, lunchers and their brown bags, skateboarders with a boom box, someone sleeping on a bench, kids dipping their feet in the fountain. But it wouldn’t be fair to write it off just yet, Philly. The park doesn’t officially open until the end of May, and by then there will be trees in bloom and greener grass. And not everyone is having a hard time with it. The best way to talk about public distaste is to just show you what they’re saying. Here are some noteworthy reactions. I'd not been near City Hall much lately, so the new look of Love Park caught me off guard. Who thought it was a good idea to turn terraced steps surrounding an iconic fountain into a flat paved oval with occasional benches!? omg how did they do a redesign and end up with a barren empty plaza?! ?